There was some disappointment when Bhutan did not win the prestigious Future Policy Award for the world’s most innovative and influential forest policies this year. 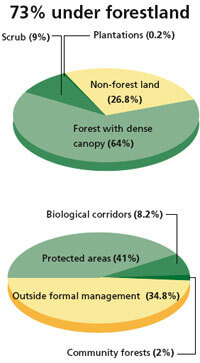 The nomination had a lot going for it—a Constitutional commitment to maintain at least 60 per cent of its land under forest cover for all time; the fact that it has set aside the largest proportion of its forestland under protected area of any country in Asia; and its community forest management (CFM) scheme that hands over large chunks of forests to rural communities to eradicate poverty. This, when the country’s community forestry initiative is as nascent as its democracy. The CFM scheme encourages rural communities in forestry to help meet their timber needs, and also meet poverty reduction targets through sale of forest produce and services. Rural Bhutan is home to 96 per cent of the country’s poor. Initially, people and policy-makers were unconvinced about CFM, says Karma Jigme Temphel of the department of forests and park services, the nodal agency for community forestry under the ministry of agriculture and forests. It took a series of supportive policy guidelines and the efforts of extension officers to spread word on the scheme’s benefits and its emphasis on local control for CFM to gain acceptance. Today, political parties in this four-year-old democracy champion CFM. “It is routine for the impacts of community forestry to be tom-tommed during the annual district review,” says Temphel. With political will, policy support, clear direction and interest from communities, CFM is clearly past its piloting phase, he adds. The government recognises community forestry as an important strategy to tackle rural poverty in the 10th Five Year Plan, ending 2013. By September, Bhutan had 328 CFM groups, involving over 15,000 families who manage over 30,000 hectares, or close to 2 per cent of Bhutan’s forestland. The numbers are expected to significantly rise in the next two years as the goal is to have at least 4 per cent of forest under CFM or private forestry by 2013. Conceptually, CFM fits nicely with the government’s “middle path” approach, with its focus on the balance between economic growth and maintaining the country’s natural and cultural heritage. Traditionally, forests were managed locally, with open access regimes guided by traditional resource use rights and ridam—traditional sanctions, restricting access to forests during certain seasons. The tradition survives even today. In the 1950s, the country took initial steps towards democratisation: from a feudal regime with local institutional arrangements to a period of nationalisation in the 1970s following the enactment of the Forest Act of 1969. The Act was later overturned by the Forest and Nature Conservation Act of 1995, which for the first time made room for private forestry on private land and community forestry on government-reserved forests, and also recognised the traditional rights of communities. Notified in 2000, this Act details the role of government and communities in managing forests. It specifies a maximum of 2.5 ha of forest per household, and more in the case of forests that provide just non-timber forest produces. A big push came in 2002, when the roles of district and block level bodies were clarified as part of the country’s decentralisation agenda. Dzongkhag Yargay Tshogdu, or DYT, became the district-level policy-making body with wide authority to formulate and approve plans, while Geog Yargay Tshogchhung, or GYT, performs a similar role at the block level, and is responsible for the custody and care of community forests and common land. The finance ministry now releases money directly to geogs, without routing it through districts. These reforms paved the way for geog forestry extension officers to assist in the implementation of decentralised forestry activities. Though incredibly lean compared to other countries, the forest department is bloated by Bhutan’s standards, with 1,500 people on rolls and a modest annual budget of about Nu 5 million (1 Nu= 2 US cents) for the social forestry division. The budget is spent mostly on capacity building, providing guidelines and awareness creation materials. A large role for extension officers is to help build trust between communities and foresters. They conduct workshops and meetings on CFM with rural communities, explaining benefits, procedures and responsibilities in each of Bhutan’s 205 geogs. Interested members apply to take over the management of a given forest after forming a committee. One prerequisite is consensus of the initiative within the community. Applications are forwarded to the district forest officer’s office. After it is sanctioned, the committee prepares a management plan and resource inventory to set harvesting limits, in consultation with the forest extension officers. “When we hand over the forest to people, we are guided by community’s traditional rights and boundaries,” Temphel explains. They also assess the community’s ability to manage it, for instance, if they will be able to share forest resources between those who have a lot and those with less. But usually communities are conservative, more so than foresters, says Temphel. Even if the plan allows them to harvest some trees, they do not want to cut, saving the large trees for their own use in future, he adds. The government does not charge royalty on the proceeds from the sale of timber or non-timber forest produces. Only a small sales tax, roughly Nu 120 per mature tree, is charged, unlike in Nepal, where forest user groups are required to pay the government 24 per cent of all income from forests. A forest near the city There is a growing demand for community forestry and the government keeps granting the rights. Rampant illegal felling, and resulting landslides and drying water sources had people worried in Chokhor, a few kilometres northeast of capital city Thimphu. Two streams that traverse through the blue pine, oak, spruce, poplar and rhododendron forest were the hardest hit. The headwaters of one stream is locally popular; its warm waters are known to cure joint aches. Following an initiative by forest extension officers, the Chokhor community established a group in 2009 to manage a patch of 45 ha forest. 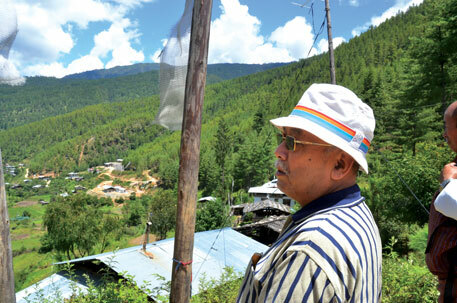 It is the first community forest near Thimphu. The management allows the committee to fell 200 trees each year, with the responsibility to reforest barren areas. The committee recently sold 500 cubic feet (1.41 cu metre) of timber at a public auction. Proceeds from the sale were put in an account held jointly by the CFM group and forest department, for future use by the community. It has also started a small plantation of 300 ha. The CFM group members collect medicinal plants, mushrooms and pine needles from the forest, with strict quotas for each household. With limited manpower to police the forest, the group has lately hired two forest guards. “The illegal felling has gone down,” says Pema Wangdi, secretary of the Chokhor CFM group. Community forestry rules allow for confiscation of equipment and fines for trespassers, ranging between Nu 5,000 and Nu 50,000, depending on the gravity of the infraction. “One case reached the courts, and the accused was ordered to pay a fine of Nu 17,000,” Wangdi says. Community forestry is difficult to implement in urban areas because of high demand for timber, says S R Gurung, Thimphu dzongkhag forest officer. People do not show much interest as the forest has be located three kilometres from the edge of a municipality, he explains. It is also challenging to implement the scheme in rural areas, given that the youth have mostly moved to cities, as they have little interest in earning their livelihoods from forestry, he says. As a country dependent on export of hydropower to India, it is but natural for planners to think of ways to share the benefits with communities. Some hydro funds from the Tala and Chukha hydro projects are being channelled to social forestry plantations, which will soon be replicated for the Kurichhu project in eastern Bhutan. “We are pushing this with the energy department, saying communities should be rewarded for their efforts in catchment protection activities,” says Temphel, adding that the department seems open to such ideas. 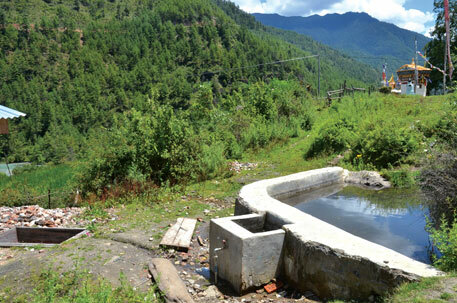 Some “payment for ecological services” schemes have already been launched in the east, where the Yakpugang community forest group is paid about Nu 60,000 a year in lieu of their efforts in catchment protection that ensures clean and plentiful drinking water supply to the district town of Mongal. As a late adopter, Bhutan was in an enviable position of learning from its neighbours. Forest department personnel, including extension officers, went on study tours to Nepal, India and the Philippines. “From Nepal we learned the importance of networking, especially for marketing, information sharing and for local governance, and how the group could be led to develop enterprise development,” says Temphel, referring to the Federation of Community Forestry Users, Nepal (FECOFUN). It is a powerful apex group of 13,528 forest user groups, representing 8.5 million people, that helps its members turn a profit. This is when community forestry in Nepal has started from scratch, by planting trees, managing them and protecting the severely degraded forests. Bhutan is looking at ways to replicate their economic success, but not adopting models blindly. There were few takeaway from the Indian experiences with joint forest management. “I find the model does not really empower people, with only some benefits of non-timber forest produce being handed to people,” Temphel adds. Just read the article. Everything that has been done for the conservation of forest is insignificant in comparison. By increasing investment in the conservation and protection of nature can build a better future. I appreciate your desire and dedication to protect the environment. Keep up the good work.